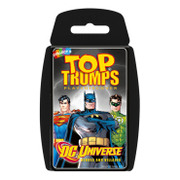 Classic Top Trumps Horses & Ponies - The world's most beautiful, elegant, powerful and amazing horses come together in Horses & Ponies Top Trumps. See how these majestic animals from all over the world compare on speed, beauty, sportability and more! Featuring 30 of your favourite horse breeds... plus a few surprises!